The most notable project to come from Dugan’s group was the Project Ara modular phone, which allows different phone configurations to be constructed from various parts. The plan is to use Google’s scale and resources to accelerate the project, as well as other wild ideas like security tattoos and other biotech sensors. In the not too distant future, we could see cyborg plants that tell us when they need more water, what chemicals they’ve been exposed to, and what parasites are eating their roots. These part-organic, part-electronic creations may even tell us how much pollution is in the air. And yes, they’ll plug into the network. That’s right: We’re on our way to the Internet of Plants. That’s the message from Andrea Vitaletti, the head of a blue-sky research group working on this very thing at a lab in Italy. The project is called PLEASED, short for “PLants Employed As SEnsing Devices.” Though the project is still in the early stages, Vitaletti believes plants could serve as ideal sensors, monitoring so many aspects of our environment. Plants are cheap and resilient, he argues, and they could potentially monitor many different things simultaneously. “Plants have millions of years of evolution. They are robust. They want to survive,” Vitaletti says. Most people think of bitcoin as a form of money, if they think of bitcoin at all. But 19-year-old hacker Vitalik Buterin sees it as something more — much more. He sees it as a new way of building just about any internet application. The bitcoin digital currency is driven by open source software that runs across thousands of machines around the globe. Borrowing code from this rather clever piece of software, independent hackers have already built applications such as the Twitter-style social network Twister , the encrypted e-mail alternative Bitmessage , and the unseizable domain name system Namecoin . But Buterin believes that many other applications can benefit from the genius of the bitcoin software, and that’s why he’s joining forces with several other hackers to create something called Ethereum . He envisions Ethereum as an online service that lets you build practically anything in the image of bitcoin and run it across a worldwide network of machines. At its core, bitcoin is a way of reliably storing and moving digital objects or pieces of information. Today, it stores and moves money, but Buterin believes the same basic system could give rise to a new breed of social networks, data storage systems and securities markets — all operated without the help of a central authority. The three Russians who ordered drinks on the chilly afternoon of November 1, 2006 had little of the lethal glamour one might expect of spies. True, two of them were smoking cigars and drinking gin. But the other, a fair-haired man whose slightly angelic face and wide eyes gave him a look of worried alertness, was dressed inelegantly in a khaki t-shirt, jeans, and a denim jacket. He sipped green tea as the smokers, complaining about the small British measures, ordered several rounds of drinks at once. Andrade placed their orders on a tray, but when he reached their table, one of the men obstructed him. The moment had an unforgettably hostile edge to it. He struggled to put the drinks down, finally managing to sit them next to the tea pot. The men eventually left, and Andrade cleared the table. As he poured the remaining tea away, he noticed that the consistency of the liquid that tipped into the sink was strange. Gooey. He couldn’t have known it as he puzzled over its weird yellow tinge, but the man who’d been sipping the tea was a 43-year-old Russian dissident called Alexander Litvinenko, and the tea itself, draining away into the London sewers, was lethally radioactive. Litvinenko lived in north London’s desirable Muswell Hill; he left the Pine Bar and arrived back home around seven. He changed his clothes, sat down to a chicken dinner prepared by his wife, Marina, and spent the evening watching Russian news online. Four hours later, he went to bed. Before long, however, he was up again?—?vomiting with such violence that Marina began to panic. She brought him wet towels, dosed him with magnesium tablets. Nothing seemed to work. During the night, his temperature plummeted, yet he begged for the windows to be opened so he could gulp down more of the freezing November air. Modern technological warfare requires a level of cognitive ability and discipline unique in the history of armed conflict. Recent advances in physiology, nutrition, neuroscience, and engineering offer a significant potential to prevent or reduce the degradation of a warfighter’s mental or physical capabilities in this demanding environment. The authors explore four categories for potential enhancement of military personnel: genetic or computational-mechanical alteration of the human body; physiological monitoring and tighter coupling between man and machine; pharmaceuticals; and nutrition and supplementation. None of these types of enhancements is without controversy; in particular, genetic intervention would require morally intolerable experimentation. In the foreseeable future, the military enhancement technologies most likely to see use will be akin to those seen in elite athletics. Physiological monitoring and feedback, changes in nutrition, and careful pharmaceutical interventions all could improve warfighter performance, and, the authors assert, such enhancements are not morally problematic if their effects are candidly assessed and revealed. In choosing whether and how to enhance military personnel, the government must balance long-term health hazards with a reduced risk of near-term injury or death. If physiological monitoring and feedback (and regulation, through drugs or other means) can decrease large, immediate, or long-term risks to the life or well-being of service personnel, the authors write, there appears to be a moral obligation to provide those enhancements to warfighters. See also: This Scientist Wants Tomorrow’s Troops to Be Mutant-Powered. That’s all a way of ignoring the systems that make the world possible. One example from the ‘60s that I think is pretty telling is all the road trips. The road trips are always about the heroic actions of people like Ken Kesey and Neal Cassady and their amazing automobiles, right? Never, never did it get told that those road trips were only made possible by Eisenhower’s completion of the highway system. The highway system is never in the story. It’s boring. What’s in the story is the heroic actions of bootstrapped individuals pursuing conscious change. What we see out here now is, again, those heroic stories. And there are real heroes. But the real heroes are operating with automobiles and roads and whole systems of support without which they couldn’t be heroic. CD: Klint, did you . . . we had Shanley on. She’s one of the shows we’re going to talk about in a bit but you saw some of the things that happened at conferences. Defrag opened up their conference with a whole section on there will be no talk of this and there will be no [00:08:05]. Conferences with disclaimers, there’s a O’Reilly conference coming up called Solid and when you apply one of the things they ask you is are you gay, black or are you one of these things that we don’t normally have on stage because we’re going to instantly give you more credit in consideration. When I filled out the Solid to speak at Solid, I thought to myself wow, this is kind of crazy. What did they call it back in the 60s and 70s when they moved people through government ranks because they were minorities? Affirmative action. There’s digital or affirmative action happening. It’s just really strange. AW: Digital affirmative action, yeah. KF: – worse outside of the tech industry but I’m glad that all these things are getting more attention. I don’t know how it’s all going to play out but there’s definitely a strong reaction against all of it as well. The more women that speak out the more just misogynistic douchebag guys also like react to it and actually kind of double down on being pricks and I don’t know where it’s all going to end up. I don’t know if there’s a better way of addressing the issues. Since recording the show, Shanley has launched her own tech publication Model View Culture. You can read an interview with her about the new endeavor here. “The motherboard, battery board, and display adapter board are designs from whole cloth,” Huang says of the machine. “Every trace on those PCBs was placed by my hand.” They also designed the case, which includes several components that you can print from a 3-D printer. And instead of proprietary firmware, they used the open source Das U-Boot. 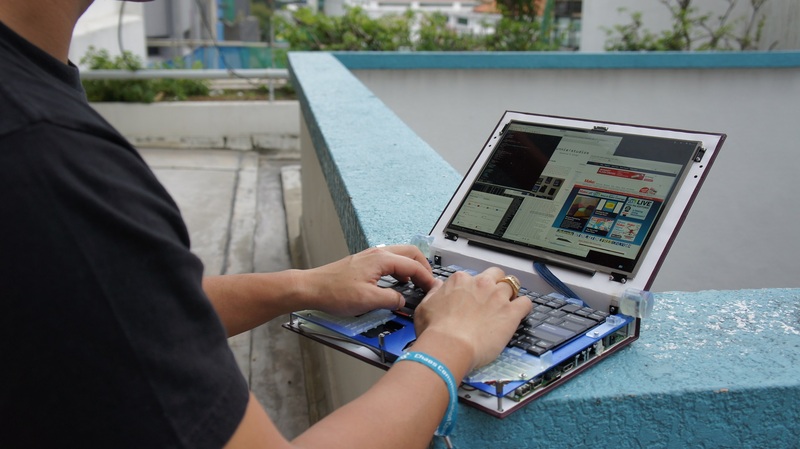 It’s not the fastest or the most portable of laptops. Equipped with 4GB of RAM and an ARM processor you’re more likely to find in a cell phone, it offers the power of the average netbook, but it’s the size and weight of a budget laptop from the middle aughts. “It’s no feather,” Huang says. But what the Novena lacks in modernity it makes up for in transparency. “If you see something suspicious in the hardware, you have the opportunity to look it up in the reference schematics and see if it really is a cause for concern,” Huang explains. In other words: you can check for NSA backdoors.